This entry was posted in climate, environment, politics, SciBlogs, science, Science and Society and tagged El Niño–Southern Oscillation, global warming, Intergovernmental Panel on Climate Change, La Niña, Pacific Ocean, SciBlogs. Bookmark the permalink. It’s an interesting article but I was taken a back by the cover. Not the first time an editor or publisher has used an inappropriate headline or label to attract attention and exploit controversy to boost sales, “The God Particle” springs to mind. Unscrupulous sceptics have used it many times. The Daily Mail and The Telegraph are examples where a phrase, sentence or even email has been taken out of context to misrepresent the detailed account. Not the first time an editor or publisher has used an inappropriate headline or label to attract attention and exploit controversy to boost sales, “The God Particle” springs to mind. A catchy headline can do a lot of damage. Science deniers don’t read beyond the headlines. Much the same thing happened with National Geographic and their “Was Darwin Wrong?” cover story. Well, no. He wasn’t. But you’d never know from the creationist blogs that took just the cover and ran with it. Funny how Roger Pielke Snr has been saying for years that the oceans are the main heat sink for years, and was vilified for doing so. Besides if anybody was silly enough to “vilify” him for saying something so mundane as “the oceans are the main heat sink”, he could just point to the mainstream science. Where did you get this strange story from? Andy probably sourced it from The Daily Currant. In terms of the NS article, we know that the models are running too hot and climate sensitivity to CO2 has been downgraded by several recent papers, as acknowledged by the IPCC. So while less heat emission from the sun may be part of the reason, it must surely also have something to do with the global financial crisis and the economic slowdown that occurred in many countries for a few years. That meant less business activity, less manufacturing, less transport and less emissions. In turn it slowed the global climate change at least a bit. 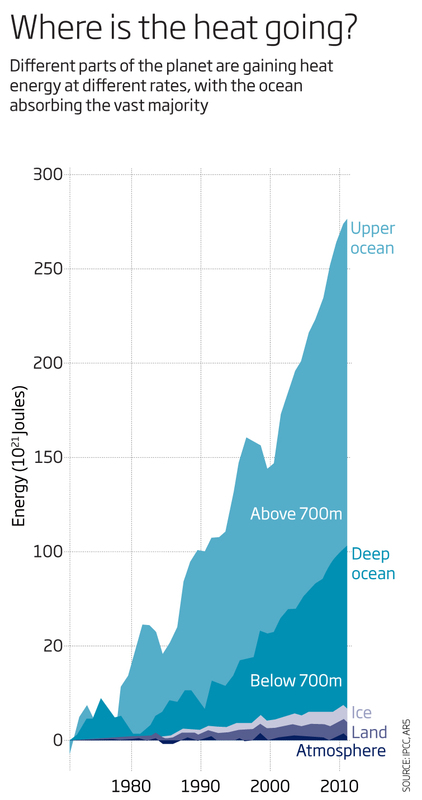 And while it takes a lot of heat to warm up water, the long term effect on ocean temperatures that are rising more gradually, will also be affecting global climate severely and catastrophically. It may just take a bit longer. The absorbed heat in the ocean water will lead to weather changes, as it already has over recent decades, and also have glaciers and ice caps around the poles been melting at unprecedented rates. I would not rest calmly on reading this more qualifying bit of scientific news. Andy, read the article – they discuss the problems with models there. Andy, I read your links. I still have no idea where you got this strange story from. Neither link supports your claim. Roger Pielke Snr has been saying for years that the oceans are the main heat sink for years, and was vilified for doing so. So Roger has been saying for years that the oceans are the main heat sink. Yet you claim he’s been “vilfied” for saying so. You’ve got it wrong again. You might even want to take the parts from your links where they mention “oceans are the main heat sink” and quote them directly. Also, it would be interesting to see just how “they” “vilified” this poor man. Then don’t let “them” get away with it, Andy. Tell us who “they” are and show us the bit where “they” vilfy Roger because he said that the oceans are the main heat sink. I followed the link you provided and it led to a short editorial that didn’t mention models. Is there a full article that is not behind a paywall? Yes, there is a full article. If you are registered you can access it although I bought my own copy. The reference to models is entitled “Why didn’t models predict the slowdown” on p 36. Yes, there is a full article. If you are registered you can access it although I bought my own copy. Mind you, I don’t buy New Scientist regularly as it usually disappoints – just that this headline did jump out at me in the supermarket. 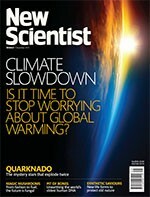 I haven’t bought a copy of New Scientist for a long time. It’s Christmas, egg nog takes precedence over magazines! “In terms of the NS article, we know that the models are running too hot and climate sensitivity to CO2 has been downgraded by several recent papers, as acknowledged by the IPCC. I guess they are covering themselves as the dangerous AGW theory starts to lose credibility”. Andy – your completely kidding yourself if you think you are part of some consensus and “they” are a fringe element. You are the fringe element because by your own admission you only read blogs and you think it’s all about short term variations. The basic science (like the speed of light) doesn’t “go away”. The accumulation of stored energy in the system has to be somewhere. In the atmosphere, in the hydrosphere or even the geosphere. What is precisely indeterminable because of complex processes like deep ocean currents, is the rate at which it migrates from one to another but migrate it does and the oceans like the ice are very large reservoirs but they ain’t infinite! This stuff is going to come back at you sooner or later. If the amount of warm “water” is coming into the bath faster than its going out, it’s rising and it’s going to overflow! Andy+Keyboard+Eggnog = Roger Pielke Snr has been saying for years that the oceans are the main heat sink for years, and was vilified for doing so. There was also that bit about the glass jars.